Over the past 3 years, I’ve fed my two boxer mixes a raw dog food diet. I’ve alternated between buying pre-made, commercial raw dog food and putting my dogs’ own raw meals together myself. I’ll admit that nothing beats the convenience factor of simply dishing out a balanced, store-bought raw meal, but it is more expensive. While it takes more effort to come up with recipes for my pups’ raw meals myself, it’s more cost effective. I combine different ingredients from a variety of sources such as raw pet food retailers, grocery stores and farmers markets. The recipe below is an example of one of Missy’s & Buzz’s raw meals (before Missy started eating Darwin’s raw Cancer Support Formula meals). I like to take pictures of them and came across this one while cleaning up my photos on my phone. 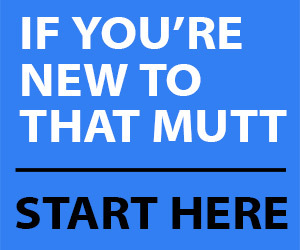 I figured I’d put it to good use before deleting it by sharing it here on That Mutt! 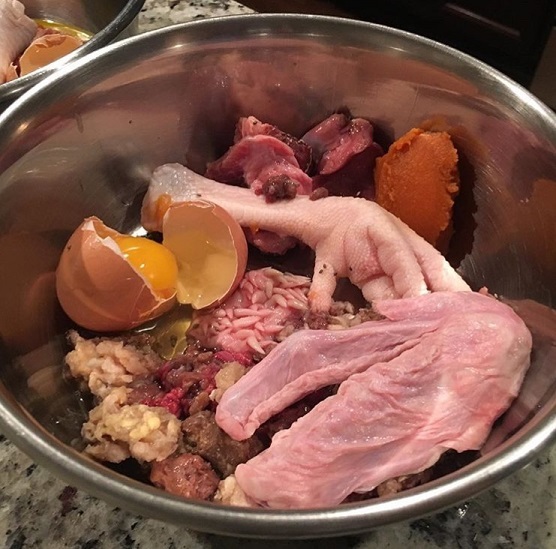 I put this raw meal together following the 80% muscle meat, 10% raw meaty bones and 10% organs formula of raw feeding for dogs. You’ll notice that it features a variety of protein sources. The reasoning behind this is to keep mealtime interesting. It also ensures the pups get all the different minerals and vitamins they need. Different cuts of meat from different animals contain different nutrients. Let me add a few words about balance and protein rotation. Not every single meal has to be balanced and consist of muscle meat, raw meaty bones and organs. Instead, try to achieve a balanced nutrition over the course of 7-10 days. Sometimes I’ll only serve a chicken leg quarter or a duck frame for one meal, and then make sure to add organs in the next meal. The same applies to different protein sources. Not every single meal your dog eats has to consist of cuts of meat from different animals. You could feed chicken for 2 days and then switch to beef the following two, etc. I base my protein choices around meat deals found both online and in brick and mortar stores. I also typically stock up when I see organic ground turkey or beef on sale at the grocery store. If I don’t end up feeding the meat the day I purchase it, it’s going into the freezer for a few weeks until I need it. I added some canned pumpkin purée and an organic egg including its shell for an extra nutritional boost. Pumpkin purée is rich in fiber and good for the digestive tract. Eggs are a complete source of protein because they contain all 8 essential amino acids. They’re also chock full of minerals, vitamins, and omega-3 fatty acids. It only takes Missy & Buzz a fraction of the time I spent putting their meals together to clean out their bowls, that’s how much they love their fresh food! I’m particularly pleased with how enthusiastic Buzz is about the raw meals. He used to be a very finicky eater back when the pups ate kibble and wet food. I constantly had to rotate brands and flavors and come up with a variety of meal toppers to get him to eat. Sometimes he’d even walk away from his bowl. I suppose it was his subtle way of telling me to switch things up!! 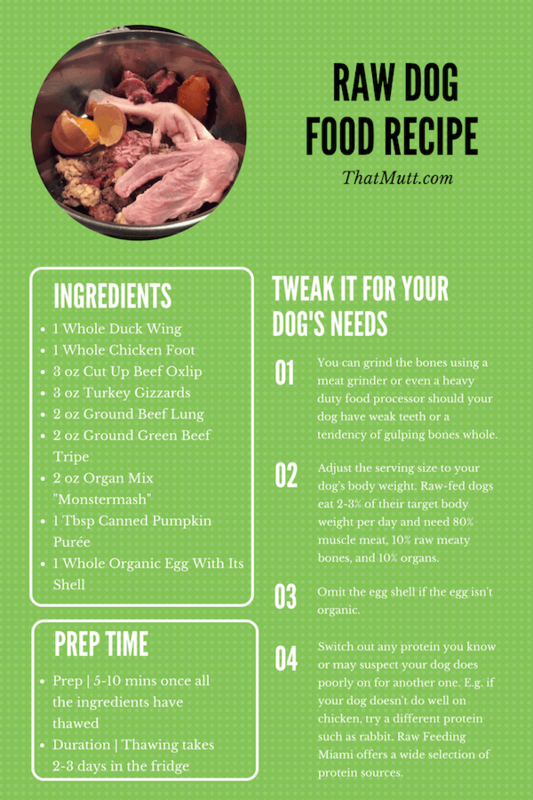 What are you feeding your dog this week? Do you have any questions about raw feeding? i feed my girls a combination of kibble, raw venison, steamed peas, carrots and kale, goats milk kefir, non fattening plain greek yogurt. sometimes i will give them sardines in water or cook salmon for them. the venison is human grade. I’m starting to study now to change my dog’s food from dog food to a balanced diet. Your recipes have helped me. I confess I have a bit of disgust at seeing these ingredients but if it is necessary for his well-being, I will do for sure. I will look for more materials to continue learning with you! Thank you for sharing your knowledge. Yay! I’m happy that you’re finding the information on raw feeding helpful and I think it’s awesome that you’re being proactive and researching a healthy diet for your dog. It would be awesome if you would share a picture of a raw meal once your dog is part of the raw feeding club! Enjoy the journey, it’s a rewarding one!